For my first review, I’m going to write about 750words, just because it’s been such a huge influence in my life for the past couple of months. 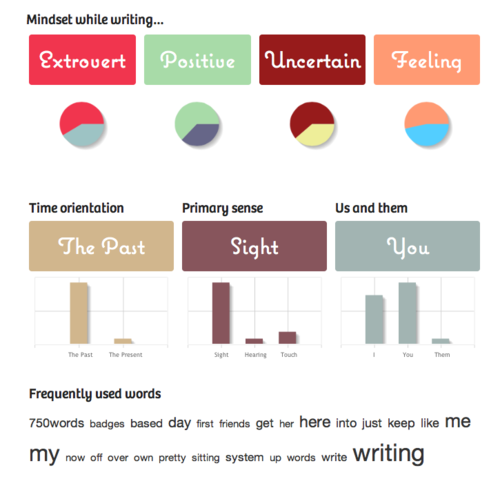 It’s a free web service that allows you to type in 750 words per day, and keep track of your writing tendencies. For the first time ever, I’m writing on a continuous basis outside of school. I graduated back in December 2010 from college, and I had a very difficult time motivating myself to keep writing. I realized that having an English class every semester for the past four years kept me afloat, kept me writing and drafting. I had an audience to write for, whether it was for my professors or for other students in a workshop, I had a writing ethos to maintain. When that support was pulled out from underneath me in December, I sort of descended into a few very unproductive tendencies. Instead of taking time to keep up with my reading and writing, I was drinking beer and playing video games a little too much. Going out to bars, running around Waikiki with my friends, and never sitting down to plunk out some writing at the computer. If I’m going to be a “for reals” writer, I’m going to have to write on a daily basis, and that’s it. I have to admit, social networking played a small part in getting me hooked onto 750 words. I posted these screenshots to Facebook, and then my friend, Allison, began posting her own. I watched in astonishment as she quickly nailed her first badge, the 30 day Albatross. See, the badges are based on cute little animals, and mark whenever you reach an achievement. This was great– I was combining an achievement system (one that I enjoy based on my history with Steam gaming) with my writing. And I was determine to get a 30 day Albatross just like Allison! Soon the allure of badges kicked the positive reinforcement part of my brain into overdrive. I was like a rat pressing a lever over and over for some food. I wanted those badges, goddamnit. 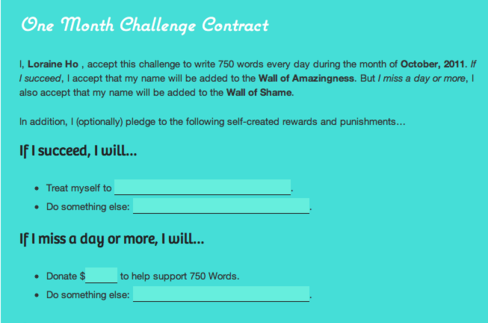 750words also has another ingenious motivator– the Monthly Challenge. Basically, you sign a contract promising to write 750 words a day. If you don’t, then you are put onto the Wall of Shame. You also get to write down your own punishment or reward, based on whether you complete your month or not. I actually missed one day in August during my move. I forgot that I had set the time zone to Pacific Time, and my 750words account was no longer set to Hawaii Time. I was so angry at myself, so I signed up for the September and October challenges. 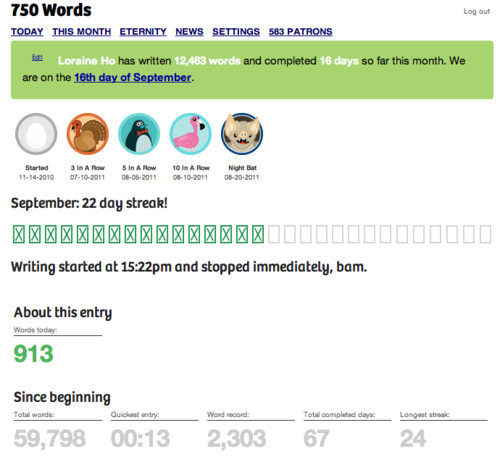 So far, I’m 16 days into September, with 12,463 words behind me, and I really can’t quit. It’s so addictive and fun, and I love keeping up with what my friends’ achievements. If you’re looking for a way to keep you writing consistently, then join 750 words. Share your achievements with your friends and keep on writing!